How might we make Dubai’s citizens happier? Participate to test your skills within data analytics, design, business models or creativity, find co-founders for a new venture, or simply have a great time. Join as a team or individual – we will have a team formation session. The vision of Startupbootcamp Dubai Smart City Accelerator is to pave the way for Dubai to become a smarter and more connected city for residents, businesses and visitors, making it one of the happiest and most enjoyable places to be. 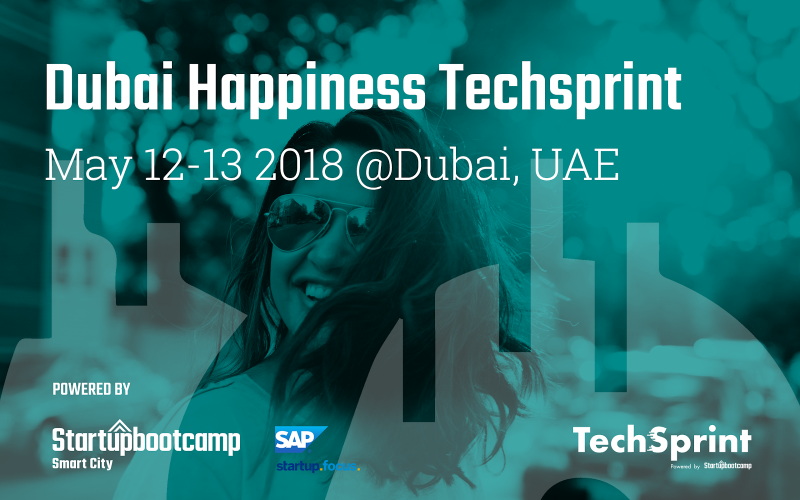 If you want to experience how much can be achieved in 24 hours, join us for the Dubai Happiness TechSprint! TechSprint is an updated hackathon format. It’s the latest platform within rapid concept development and personal growth. Originated in Copenhagen Denmark, it has now traveled to Dubai to take on the challenge of improving the lives of the citizens of Dubai. And we need your help! You’ll pitch your own idea or listen to others, then vote on the most interesting ideas and form teams with diverse skill sets. You can come with friends, but you’ll get the full experience if you participate in separate teams. The idea you pitch and the problem you set out to solve can span social, educational, financial, environmental, or other issues. ubai is increasingly becoming a smarter city with various IoT sensors collecting vast amounts of data. It is all being collected in Dubai Open Data. Maybe this data is able to inspire good solutions? Using the data in your solution is not a requirement, but we would like to see you be inspired from it. Amazon Web Services credit codes worth $50 are available to each team (max. 10 teams). Mentors are available Saturday evening between 7.30 and 9.30 p.m. Feel free to consider them a resource and pick their brains. 30 talents, 24 hours, 6-8 teams, 2 winners. Initial pitches: Everyone are invited to pitch their initial ideas. You will have ~60 seconds and are allowed to pitch as many ideas as you please. We advice to structure it as follows: 10 sec: Who are you? 30 sec: What’s the problem you’re addressing? 20 sec: Who do you need to solve the problem? (e.g. programmer, data scientist, business and/or designer?). Final pitches: Each team gets 3 minutes + 3 minute jury Q&A. 1 prize for best overall concept & 1 prize for best use of data. Prizes include 3 months office space at Startupbootcamp in DTEC. Happiness: To which degree will it make the citizens happier? Feasibility: How easily is it implemented? Viability: Will it make for a sustainable business? Minimum 3 and maximum 5 participants per team. Teams can be formed beforehand, please indicate your team name in the application. If you don’t have a team, we will facilitate team formation after the initial pitches. We don’t require you to write code but we do enjoy seeing a demo come to life in only 24 hours. Pre-written code is allowed but has to be relevant to the challenge. Lots of energy! Besides that, bring a laptop and the materials needed to create a winning solution. We’ll set up a dormitory, so If you wish to sleep over, bring a sleeping bag and a sleeping pad. Startupbootcamp Smart City Dubai is the leading program supporting innovative companies in the IoT & Connectivity, Urban Automation & Mobility, Artificial Intelligence, Blockchain, Open City Data, Sustainable Cities & Living, Smart Government, and Smart Retail industry. From the vision of Sheikh Mohammed bin Rashid Al Maktoum, Vice President and Prime Minister of the United Arab Emirates, and ruler of Dubai, we are inspired to bring more innovation to Dubai. Together we are engaging globally with entrepreneurs and innovators to carry out this grand vision to make Dubai a smarter and happier city.